According to the Economic and Social Survey of Asia and the Pacific 2006, global economic growth slowed to 3.2 per cent in 2005, down from the record growth rate of 4.0 per cent in 2004. 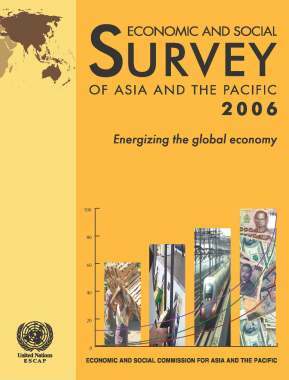 The growth rate of developing countries in Asia and the Pacific also decelerated moderately in 2005. The slowdown in the global economy and in ESCAP developing countries was the result primarily of high and volatile oil prices and a softening of global trade. More expensive oil also heightened inflation in the region; however, overall price pressures remained mild by historical standards. Prospects for 2006 indicate that GDP growth should maintain its current momentum while price pressures abate slightly. This is based on the following assumptions: oil prices do not increase significantly, large global current account imbalances do not unwind precipitously and a judicious mixture of monetary and fiscal policies preserve the growth momentum while keeping inflation in check. The region also faces the threat that avian influenza might develop into a pandemic. Other policy challenges facing the region are its fast but inequitable growth and the implementation of the multilateral trade liberalization agenda agreed at the Sixth WTO Ministerial Conference held in Hong Kong, China, in December 2005. The Asian and Pacific region also needs to address the twin problems of unemployment and underemployment. The incidence of unemployment appears to have increased despite rapid growth in recent years while underemployment remains more serious than unemployment, especially in rural areas. Even within the ranks of the employed the vast majority of workers earn paltry wages and thus remain vulnerable to internal and external shocks. A disturbing aspect of the problem is the phenomenon of youth unemployment, which appears to be on the rise. Governments thus need to take a number of initiatives to improve the functioning of labour markets, specifically to enhance youth employment, and improve the productivity and earnings of all workers. For their part, employers need to display better corporate responsibility by providing training opportunities for their workers to enable them to enhance their skill levels in today’s rapidly changing global economy.